My newest interest is quilting. 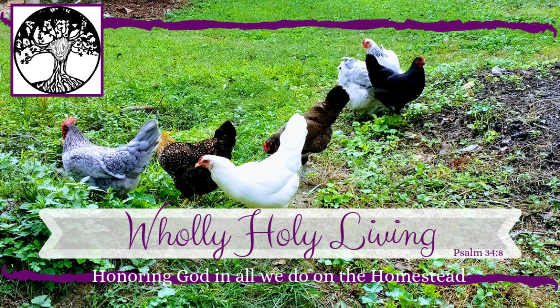 I’ve been making a concentrated effort to learn and master new life-skills that will be beneficial to us on the homestead and that are being lost or dying within my millennial generation. I have enjoyed sewing since I was maybe 7 years old and my grandma gave me a small hand sewing kit and some scrap fabric. I remember practicing stitches making tiny 8×10 inch quilts for my Barbies, and sewing rudimentary doll clothes. I dabbled in hand sewing and spent a week with my grandma one summer learning how to cut and see patterns and use a sewing machine. Most of that sewing machine knowledge was wasted on me as I didn’t have one of my own to practice on, and when I finally got one, it was so much older than the one I learned on, not much of the threading or maintenance applied. 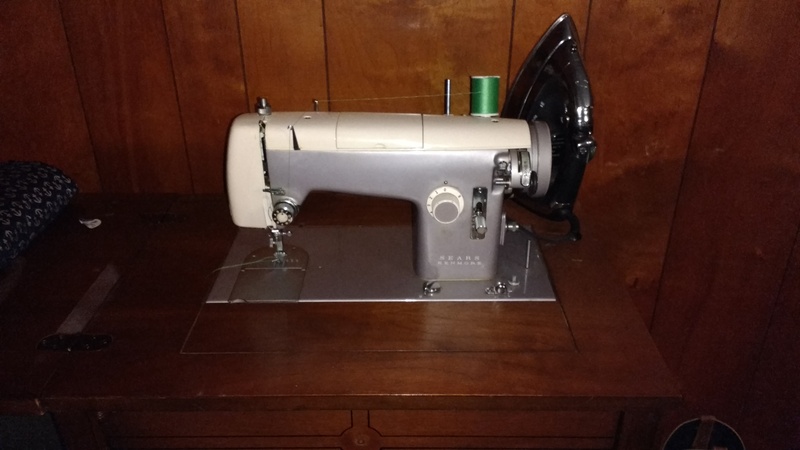 Anyway, I’ve been sewing on my husband’s late grandmother’s vintage Sears Kenmore machine, which is beautiful and still functional! I recently ordered oodles of replacement belts to have on hand as they’re difficult to come by. The other is for a different friend who is expecting her second child in July. 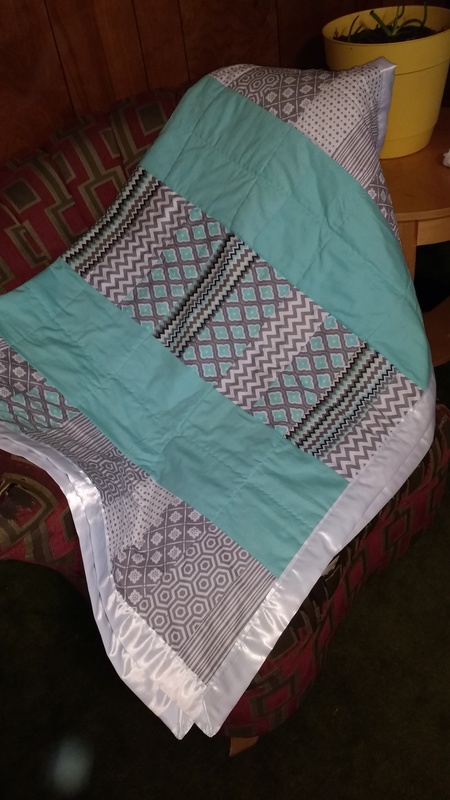 It isn’t finished being quilted, and doesn’t have a binding yet, but I still have a couple weeks before the baby shower (or sprinkle as they’re calling it). 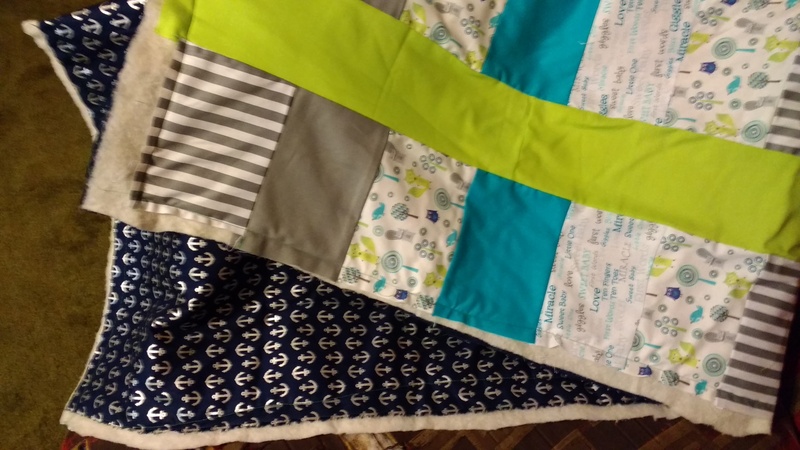 Both have been “coin quilts” because 1) it’s a simple block pattern and goes together quickly 2) I liked the design 3) it’s symbolic for me in that I’m giving them “coins” from my time and energy even if I can’t necessarily give them as much “coin” from my wallet. I have always appreciated and admired handmade gifts a bit more than store bought, not that I didn’t appreciate gifts purchased with me in mind, but that I know how valuable and limited my free time is and to think that someone willingly sacrificed their time and spent it thinking of me or my family while crafting a gift is just extra special. I hope to be the “quilt lady” within my sphere of influence who makes them as gifts for special occasions. Maybe some will pop up on the Etsy shop as well, who knows.